← Is a Hot Dog Day a Sandwich Day? While one of the responsibilities of NASCAR haulers is getting their respective racecars to the track for each event, the driving part only makes up a small percentage of the job, according to Price. They drive about 50,000 miles per year, which they split in half between the team of drivers. Most teams consist of two drivers. Price’s co-driver for Kyle Busch’s car is Brendan “Slim” Greene, who won the first Challenge event in Atlanta earlier this year. Price and Greene may not travel to each event together, but they are both responsible for more than just ensuring the race car arrives on time. These gentlemen maintain everything, from the front to the back of the trailer, and even cook their teams lunch and dinner. In addition to all of those tasks, Price handles setting up the observation deck, which is located on the top of the trailer. Price has been driving haulers for NASCAR race teams since 2004 when he began driving the truck for Hank Parker Junior. He takes a lot of pride in making sure his truck and all its components are clean and up to par, but he also genuinely enjoys being on the road. “I am a truck driver at heart – I love driving across the country. I got excited when it was time to head to Sonoma,” he said. Sonoma was not the first time Price has won a Challenge competition; in fact, he’s won the event twice in previous years. Compared to previous events he’s won, he felt the Sonoma Challenge was at about the same difficulty level. When he’s not competing in driver Challenges or traveling back and forth between race tracks and the Joe Gibbs Racing Shop in Huntersville, North Carolina, he’s hunting, fishing or working on old cars at his own shop in Mooresville, North Carolina. 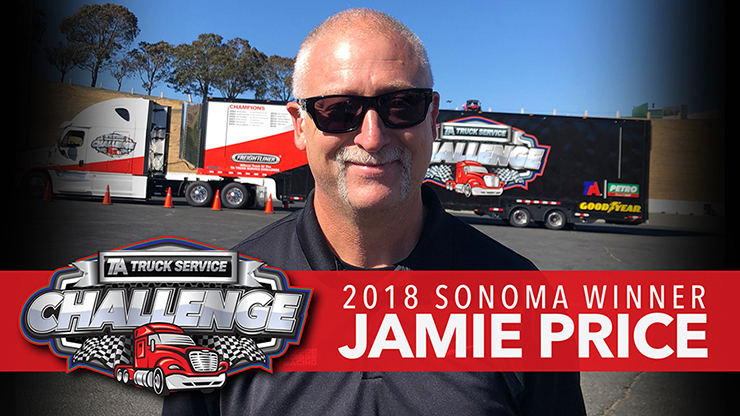 Price says he plans on using his Sonoma Challenge winnings to support his shop hobby, and he’ll be back to win the remaining Challenge competitions this season. You can catch Jamie Price and his fellow Challenge competitors at the next event, which will take place at the Kentucky Speedway on July 12.